General Motors is getting out of Venezuela, and it's far from alone. The automaker shut down operations in Venezuela after government authorities seized one of its plants there Wednesday. Venezuelan officials haven't responded to CNN on why the plant was seized. GM (GM) is just the latest major multinational company to report massive problems from operations in Venezuela. The country is in the midst of weeks of bloody protests by its citizens demanding a change of government after years of political turmoil and a severe economic crisis. In 2015, Pepsi (PEP) took a massive $1.4 billion loss from its business in Venezuela, citing the country's plummeting currency and political mess. At the time, Pepsi said it will no longer count its Venezuela business in its overall revenues. Mondelez (MDLZ), maker of Oreos, wrote off its Venezuela business after taking nearly a $800 million loss last year. Although it sells Oreos and other products in Venezuela, it doesn't count that business in its overall operations. McDonald's (MCD) still operates in Venezuela, but in the last two years it's had to temporarily halt sales of french fries and Big Macs due to food shortages. Delta (DAL), American (AAL), United (UAL) and other airlines are collectively still trying to claw back $3.8 billion in profits frozen in Venezuela. Those airlines, along with Lufthansa, Alitalia and LATAM, either drastically reduced flights to Venezuela or stopped flying there entirely. Coca-Cola (KO) has recorded multiple losses in recent years from its Venezuela business, and it temporarily halted production there last year due to a lack of sugar supply in the country. But it still operates there. Venezuela is home to the world's largest oil reserves. That used to attract oil service providers like Baker Hughes (BHI) and Schlumberger (SLB). But in the past year, they've shut down some of the rigs that dredge up Venezuela's oil, citing unpaid bills from the government. It's a major reason why Venezuela's critical oil production is in sharp decline. Nearly 10% of U.S. companies in the S&P 500 -- 46 firms -- have had exposure at one point since 2015 to Venezuela's plunging currency, the bolivar, which is worth less than one penny now. IBM (IBM), Oracle (ORCL), DirecTV (DIRV), GE (GE), and Ford (F) are among firms that have mentioned at one point exposure to Venezuela in earnings reports and many of them have stopped counting any revenue from Venezuela. The corporate exodus is only one thread of a country in crisis mode. 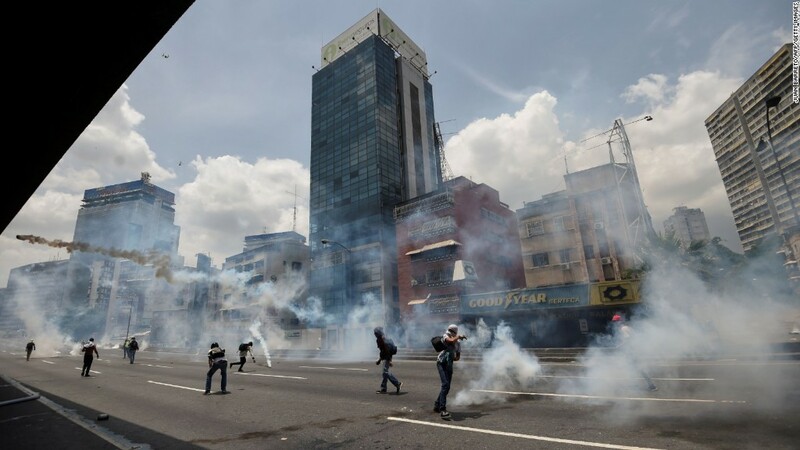 On Wednesday, three people died in nationwide protests against President Nicolas Maduro. Protests have ramped up in recent weeks after Maduro's administration barred popular opposition leader Henrique Capriles from holding any political office for 15 years. Due to the economic crisis, Venezuelans continue to live through food and medical shortages, along with skyrocketing prices for basics that are available. Food imports fell 50% last year, which is a disaster in a country that grows little of its own food, after years of the government neglecting the country's vast agricultural resources. --Rafael Romo, Marilia Brocchetto, Osmary Hernandez, Ray Sanchez, Mariano Castillo and Alanna Petroff contributed reporting.